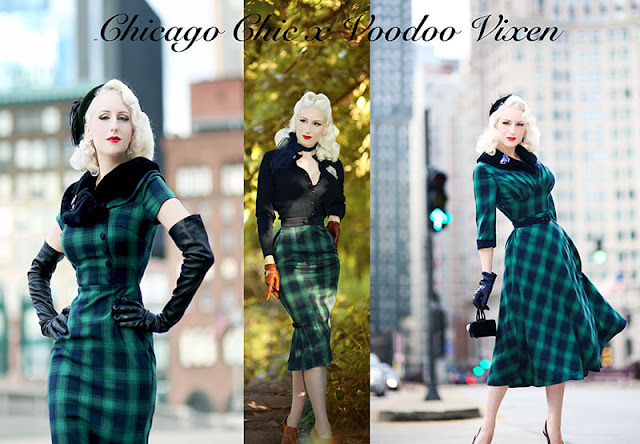 As many of you have seen on my instagram, I have been working with Voodoo Vixen to bring an exclusive collection designed by your's truly! In the winter I always crave soft, warm, fabrics especially living in a city with a legitimate cold season. I wanted this collection to reflect the luxurious glamour of winter wear from bygone eras - wools, coat dresses, furs (faux), interesting details, and I found myself particularly inspired by the intricacy of the 30's and 40's. I am so pleased with the result, as VV worked hard to bring my wishes into a reality. We created 2 luxurious frocks and an elegant partial-pleated skirt. Each design was constructed with some real weight to them - they are truly unique, one-of-a-kind pieces to treasure. I was adamant about a longer-than-usual hemline, as it is always possible to alter a piece to be shorter, but to lengthen is not possible. I am about 5'5 1/2" and wearing smalls, so you can see that even though I'm not on the extra tall side, the length hits mid-calf. Next, I wanted to have some original details & unique construction, inspired by 30's/40's designs. On the 'Lola' dress we added pleats at the bust, a bias-cut skirt, and both dresses have completely detachable black faux fur collars. I love that the dark midnight blue shade in our fabric allows for styling of both black and blue shades, and so removing the collar will give you a solid green and blue pallet if you choose. The Agnes skirt is soft, sleek, and feminine, draping beautifully against your curves without being skin-tight. We created a buttoned pleat at the hemline, that begins on each side and wraps just around the back. That Swing Dress! I need it in my life!! !